Gosh Neil, we have quite a lot to discuss. 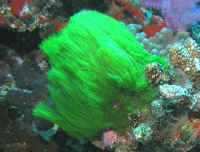 First and foremost, judging from your attached photos and description, I don't consider that you really have much of a 'hair algae problem''¦ Some algae is of use functionally and aesthetically, and the types that make up the sort shown here are not really that deleterious. 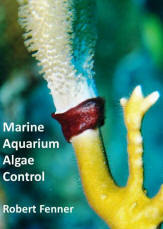 So, let's cover some of your statements w/ suggested changes that might make you a bit less fretful re the green filamentous algae in your system. 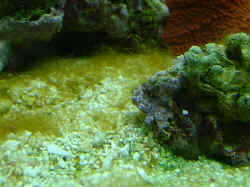 In order, the good-sized sump used as a refugium. I would increase the sand bed (hopefully a fine aragonite) to four or more inches in depth. This will greatly improve its functionality, removing most likely all nitrate (which you don't list as measured) and hopefully a good deal of the 0.1 ppm of HPO4 (which is high, particularly considering your use of chemical filtrant). I do think highly of Chaetomorpha used in these applications but leaving it illuminated continuously won't do; this and most algae and plants require a 'dark period' to do well. I would arrange/use a reverse-daylight-photoperiod (RDP) here, overlapping your tank's light regime an hour or so, but turning the refugium lighting off during the regular 'tanks on' photoperiod. Mmm, let's see, I would go away with feeding Brine Shrimp period, strained/rinsed or no. Artemia actually have little nutritive value. Depending on the age and density of your live rock, I might add a few more kilograms here, principally to bolster your waning biodiversity. I favour the Tunze line all the way around, but would definitely do a bit of reading and rearrangement re their placement. A to one-end and down and back or circular gyre design is far better than what you describe. Your stated pH is a bit low, particularly if this is a measure during the later morning or afternoon. I'd be looking into using a Kalk or Kalk-like supplement to bolster the pH a bit, as well as give you a boost in insolubilizing those phosphates. I wouldn't use the 'Snow' product as it has dubious value period. The fact that your invertebrates and fishes are doing well is the best proof that you really don't need to do anything drastic re your current situation, including the filamentous green algae. 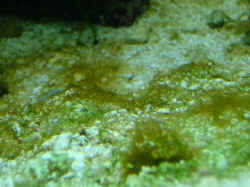 Bright green alga I just read a article on this but I didn't understand the answer here's the article http://www.wetwebmedia.com/brownalgcontfaqs.htm everything is the same as this guys. is the answer more light ? <Hmm, need more specific information... there are a few FAQs on this page... could be the/your lack of lighting. Bob Fenner> I got 3 160 watts VHO's getting 3 more this week. Question: I know there's a good number of people who suffer from Bryopsis (wiry, dark green hair algae) plagues, including myself. I've heard they usually crash over time, but I've yet to see it happen in real life. Any cures (biological or otherwise) you can suggest would be greatly appreciated. I'd soon pull out my own hair then my Bryopsis again!